This is my sixth (and last) in a series of posts for Nature Rocks, a wonderful movement that encourages families to spend more time outdoors connecting with nature. It's an idea that my family tries to live out each and every day. This week, I'm their featured ambassador, so Nature Rocks will be posting some of my tips for enjoying time outside with kids, and I'll be posting more detailed posts that correspond with each tip. Today's tip is to share your outdoor hobbies with your kids. I have no interest in raising little clones of my husband and I. I fully realize that my sons will develop interests and nurture talents that are different from my own. But I have found that being outside is a great equalizer. Long before we had kids, my husband and I discovered that we both really enjoyed hiking and camping. We grew up doing those things with our own parents and have fond memories of great family time in the outdoors. 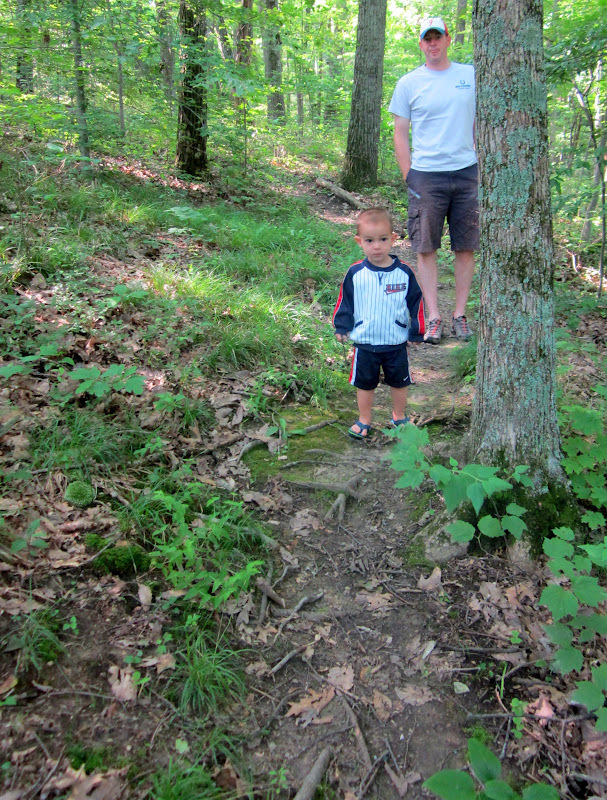 So naturally, we didn't want to stop hiking and camping just because we have young children. So we bring them along on these adventures. And we have found that they thrive joining in the fun. Regardless of what you enjoy doing outside, look for ways to involve your children. If you love to ski, enroll your kids in ski school on your next trip, perhaps they'll enjoy it too! If you love to bike, invest in a bike seat or trailer so that your kids can come. I've read posts about kids rock climbing, snow shoeing, and scuba diving. Start slowly. In other words, don't plan a 4-hour hike your first time out. Or camp in your backyard one night to test things out. Show your kids a YouTube video to introduce them to a new activity. I have a friend who often does this with her toddler, with great success. Many kids are visual learners, especially at a young age. This may help them to conquer their fears. Don't give up. I remember that our son got pretty fussy toward the end of our first family hike. But we tried again a few weeks later, and he did much better. Keep it relaxed and fun. If you're having a good time, chances are your kids will too. For more information on camping and hiking, I'm linking to a few posts I've written about each activity (some links will take you to Visit Indiana's blog, where I'm a regular contributor). That concludes my week as the featured Nature Rocks ambassador. I hope you have found my tips helpful. Please share a few of your own! I'm always looking for new ways to enjoy nature with my kids, and I enjoy connecting with others who feel the same. If you've enjoyed my posts, please consider subscribing to Arrows Sent Forth, or keep up with my family's adventures on Facebook or Twitter. Any plans to take little arrow camping this summer? I was finally ready to tackle camping with a toddler late last summer and then I got pregnant again. No way was I going to be running to the closest tree every 5 minutes with morning sickness ;-) My hubby loves to camp and was so excited. Now with our little guy on the way I'm wondering when I'll get the nerve to try a go at it. Kids may be in grade school by the time I get up the nerve.